March 4, 2015: Alzheimer’s disease is a global problem. In the United States alone, more than 5 million people have the disease and a new diagnosis is made every 67 seconds—numbers that are just a fraction of worldwide totals. Among medical researchers, Alzheimer’s is a top priority. Researchers working with astronauts on the International Space Station are embarking on a mission to discover the origin of Alzheimer’s. 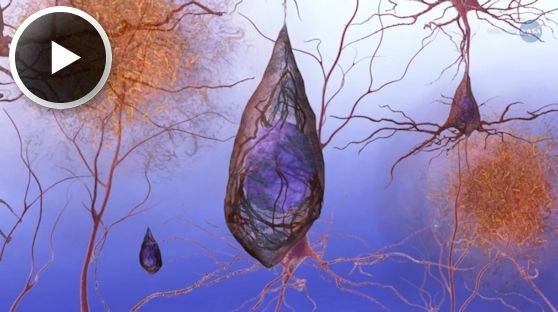 Although the details are still a little fuzzy, researchers believe that Alzheimer’s and similar diseases advance when certain proteins in the brain assemble themselves into long fibers that accumulate and ultimately strangle nerve cells in the brain. “They're sort of like the crankcase sludge of the human body," explains Dan Woodard of NASA’s Kennedy Space Center. "The fibers are not active, so they'll be around forever because your body doesn't have any way to get rid of them." These fibers take decades to form and accumulate—hence the link between Alzheimer's and aging. In laboratories on Earth, researchers have figured out how to make protein fibers accumulate more quickly, so they can study the process without waiting so long. On the space station, accumulated fibers do not collapse under their own weight, which makes the station an even better place to study them. A four-inch cube containing the experiment, which was selected in an ISS research contest by Space Florida and Nanoracks, and built at the Florida Institute of Technology, blasted off to the International Space Station onboard the SpaceX-5 cargo resupply mission on Jan. 10th. The experiment itself, SABOL, or Self-Assembly in Biology and the Origin of Life: A Study into Alzheimer's, will be fully automated. However, observations from this experiment alone won’t lead directly to the discovery of a cure. SABOL is geared more towards understanding the way that Alzheimer’s progresses, not towards creating a pill to stop it from happening. Although this experiment is only the first in what will surely be a series, Woodard is optimistic that it could be an extremely valuable learning experience. "Everybody wants a cure, but without knowing the actual cause of the disease, you're basically shooting in the dark," Woodard says. "We don't understand the true mechanism of the disease. If we're lucky, then we'll find out whether proteins will aggregate in space. Only in weightlessness can you produce an environment free of convection so you can see whether they form on their own. We expect to learn incrementally from this." Eventually, projects like SABOL could lead to the discovery of a method to slow down the rate at which the harmful fibers grow, thereby opening a window for a cure. The results of the experiment will be seen after the samples are returned to Earth and are examined underneath an atomic force microscope. Woodard speculates that the cause of Alzheimer’s could surprise us by being deceptively simple. Says Woodard, "There have to be chemicals or processes that hinder or encourage the growth of protein fibers. It may be something as simple as temperature or salt concentration of the fluid in the brain." Strange but true: The key to unraveling the mysterious cause of Alzheimer’s disease may not lie in the recesses of the human brain, but rather in the weightless expanse of space. If an answer is ultimately found, it could very well spring from the microgravity of Earth orbit. The experiment begins soon.